Why China's Pollution Could Be Behind Our Cold, Snowy Winters : Goats and Soda A video from NASA shows how air pollution moves around the world. So what happens when emissions from Asia blow across the Pacific Ocean to North America? As the airborne particles turn: Across the globe, dust (red-orange) is lifted from land, sea salt (blue) swirls up from oceans, soot (green and yellow) rises from fires and sulfur (white) streams from volcanoes and fossil fuel emissions. Many scientists think that climate change might be one cause of this year's "snowpocalypse" in Boston and bitter cold snaps in New York and Washington. But physicists at NASA's Jet Propulsion Laboratory have been looking into another culprit: air pollution in China and India. "Over the past 30 years or so, man-made emission centers have shifted from traditional industrialized countries to fast, developing countries in Asia," physicist Jonathan Jiang writes in an email. 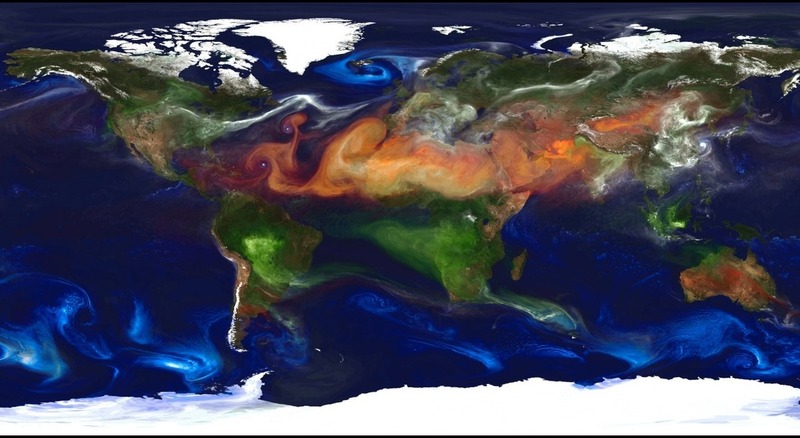 A lot of the airborne particles in the Earth's atmosphere come from natural sources, such as desert dust (red-orange) and sea salt (blue). But there's also soot from fires (green and yellow) and sulfur emissions (white) from burning fossil fuel. The colorful swirls represent airborne particles in the atmosphere. Many of those particles are sea salt (shown in blue) picked up from the ocean, and dust (shown in red-orange) scooped up from deserts. But there are also man-made sources of particles. Soot from fires is shown in green-yellow, and sulfur from fossil fuel emissions and volcanoes is in white. As the animation moves through time, you can see fires billow up from South America and parts of Africa. 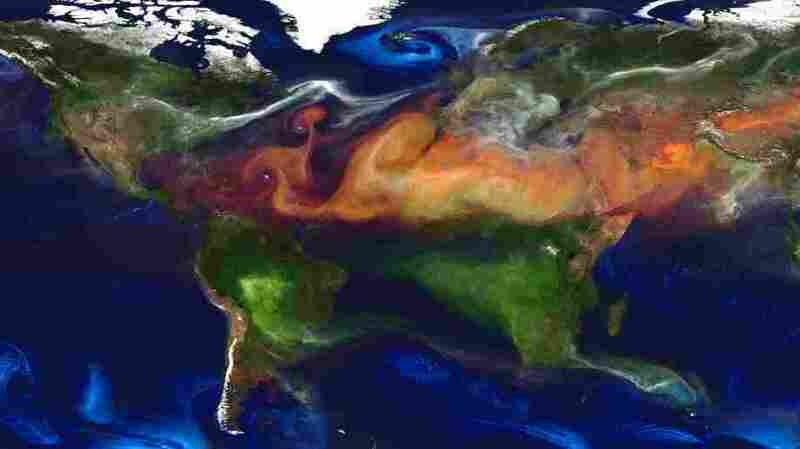 Dust from the Sahara Desert sweeps west, and power plants in North America and Europe emit sulfur that blows east. Then, about 43 seconds into the video, Asia comes into view. And its coal-powered industrialization is clear. Large swaths of emissions from burning coal pulse from China and Southeast Asia in white. Sometimes the particles blow east and mix with storms above the Pacific Ocean. These storms can have a big effect on winter weather in the U.S., Jiang says. Storms in the Pacific move northwest; some hit the West Coast and cause rain and snow. Others end up far north in Canada, where they can alter the weather across the entire U.S., Jiang says. So what does a bunch of extra pollution from Asia do to clouds over the Pacific? It makes them bigger and heavier with more precipitation, Jiang and his colleagues reported last year. "Atmospheric particles can serve as cloud nuclei and foster cloud formation," Jiang writes. The particles give water vapor something on which to condense. Jiang isn't sure yet how much the bigger storms in the Pacific are to blame for cold, wet winters on the East Coast and drought in the West. His research team is working on models and computer simulations right now to look at such questions. "We have not reached a final conclusion yet," he writes. In the meantime, people in China are starting to realize more and more the catastrophic effect the country's pollution is having on the environment and the nation's health. Just this week, the documentary Under The Dome: Investigating China's Smog went viral across China. Environmentalists are hailing the documentary as an eye-opener for the Chinese, NPR's Anthony Kuhn said Wednesday. But clearly, development fueled by coal has unexpected repercussions that spread way beyond a single country or continent.